Teamwork is one of those words you hear a lot but it’s true that most people only have a vague concept of what it means (just try asking 3 or 4 people around you for a definition and you’ll see what we mean). In general, it’s used to mean a group of people working well together. At the heart of the idea of “teamwork” is the concept that teams – big and small – can work effectively and efficiently. This may seem simple, but when you consider the fact that teams are made up of diverse people, with different working styles, personalities and individual dynamics, it’s often a wonder that we get anything done in a group at all! Over 7 years Team Bonding has developed its Amazing Race challenge to pinpoint the ways in which teams can become most effective. Many team-based activities focus on one aspect of team bonding – for example, building trust within a group. The Amazing Race, on the other hand, is designed to encourage all aspects of building an effective team, from relationships and common goals to cohesion and trust. Interestingly, winning teams can be built as needed (rather than just simply occurring naturally). They do, however, take some effort, commitment and time. 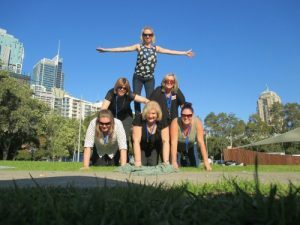 Fulfilling the Amazing Race challenges effectively as a team rewards members with great kudos, so much so that many participants are still talking about it with their work colleagues months after the event. Contact us on (02) 9949 2989 to find out how the Formula For Building A Winning Team can help your group today.